A deliciously dreamy creamy orange protein smoothie that tastes like a 50/50 ice cream shake! Many of you have been enjoying my smoothie recipes here and on Instagram so I’m excited to share one of my favorite post-workout smoothies today! It’s incredibly simple and healthy, but tastes like 50/50 ice cream. Did you ever have a 50/50 bar as a kid? They are so good… but so bad. My kids love this smoothie as much as I do and with two tangerines and probiotics it’s a great immune booster as well. Plain greek yogurt is a very strong source of protein. The yogurt I have right now, Wallaby Organic Plain Greek yogurt, has 23 grams of protein per cup! The notion that vegetarians don’t get enough protein is just nonsense, and this recipe is just one example of how easy it is to get plenty of protein in our diets. This smoothie is just as tasty green – try adding a handful of kale to the blender! Enjoy this sweet but refined sugar free smoothie for breakfast on the go, after a workout, or an after school snack. Want more smoothies to try? Here are a few favorites! 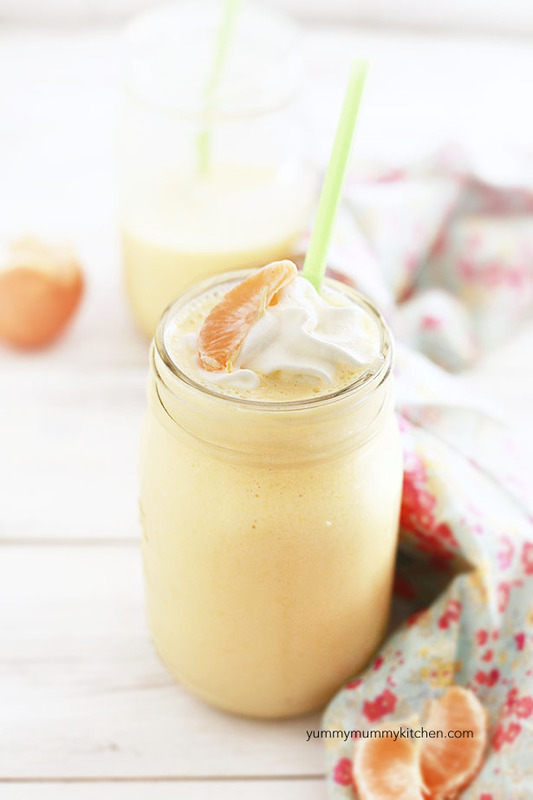 A delicious creamy orange smoothie made with Greek yogurt. Place all ingredients except for the stevia into a blender, starting with the oranges. Blend until smooth. If you don't have a high powered blender, you may need to add a little water. Sweeten to taste with stevia, honey, or coconut syrup. Add more ice if you would like your smoothie to have more of a frozen texture. Enjoy! Make it green! I love adding a cup of kale to this one for a green smoothie. *Vegan option: use coconut yogurt and vegan protein powder. I tried this for the first time today and loved it! I used siggi’s cinnamon/banana yogurt on accident, but no complaints here. This is definitely a new favorite way to help me get enough fruits in every day. Thanks so much for sharing this!